On 7 November 2018, the European Foundation for South Asian Studies (EFSAS), together with MEP Jonathan Bullock, organized a seminar entitled “CPEC – East India Company Mark 2?” at the European Parliament, in which Mr Fernando Burgés, Programme Manager at the Unrepresented Nations and Peoples Organization (UNPO), participated as a panelist. At the event, a panel consisting of Members of the European Parliament, Scholars and Academicians have discussed the construction and the legal, geo-strategic, economic and environmental consequences of the China Pakistan Economic Corridor (CPEC). In addition to Mr Burgés, among the panelists were also MEP Jonathan Bullock, MEP Geoffrey Van Orden, Dr Paul Stott (SOAS), Dr Matthew McCartney (University of Oxford), Dr Dorothée Vandamme (University of Louvain) and Mr Burzine Waghmar (SOAS). Observing that the project of the CPEC crosses the territory of Gigilt Baltistan illegally annexed by Pakistan, Mr Burgés has highlighted the negative effects of the construction of the corridor on the livelihoods of the region’s indigenous people who, deprived from access to their land and natural resources, have been further forced to accept the project with no compensation. 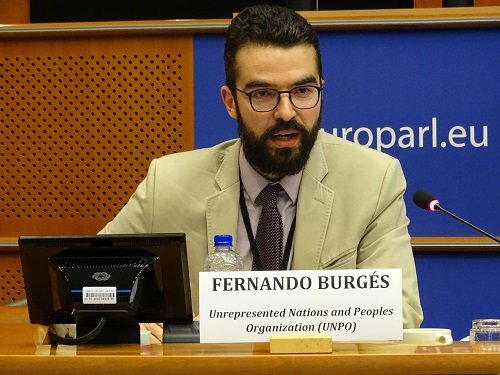 Additionally, Mr. Burgés observed the violent crackdowns and enforced imprisonment of people who tried to oppose the project under the pretext anti-terrorism laws, concluding that the CPEC translates an agreement between two States that share a similar history of treating their people with violence, injustice and abuse.